In this novel, Jenny Kalahar did a phenomenal job describing different behaviors of cats. There were times I had to laugh because I know all too well just what cats act like. Each cat has their own personality, and it was neat to see some of the different ones in this book. I also think that the events that took place in Shelve Under C were believable. There was one instance that I had to question (the price of used books), but overall, the story was written in a way I could picture what was going on and it all made sense. This is a light, easy-to-read book. There is not a lot of depth to it. Basically, you will read the day ins and day outs of the life of bookstore owners and the cats they have roaming in their store. There is a side story of a foster child woven in that I think was cute. How everything ended melted my heart. Shelve Under C is a book I would recommend to anyone. It’s clean! I think people of all ages would find enjoyment out of it. Just don’t expect anything deep. Overall, I rated this four out of five stars. A novel for everyone, Shelve Under C is a big, leaning stack of humor, heart, stray cat hairs, old book dust, mystery, family drama, longing and hope. Used bookshops often have a cat or two roaming the aisles, sleeping on the shelves, or sleeping on the customers. Here is a novel all about one bookshop and its resident cats, Stomper and Buglit; and about Kris, a 12-year-old boy who apprentices in the shop. Kris is a little bit like the cats: he’s a foster child getting used to a new family, and the cats are being fostered in the bookshop for the local shelter. Stomper and Buglit are a little bit like Kris: they get into trouble, have some wild adventures, and find out just what being part of a family really means. 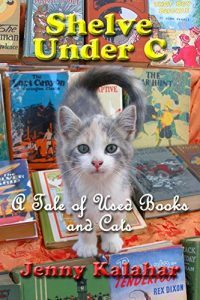 Unlike some novels that have a bookstore setting, Shelve Under C has the real spirit of the store, its owners, its apprentice, its customers, and, especially, its cats as the beating heart of this fuzzy beast. It’s full of wonderful characters, a wild storm, a doggy bucking bronco, catnip capers, an almost-deadly chicken salad sandwich, and . . . books! No need to knock — the door is open. So come on in, grab something to read, and get comfy on the big, red sofa. Sound good to you? I thought it would! Here is the buy link so you can get your own copy! It’s only $0.99, too!